The Online Journal Of Arthur Sido: Welcome To The Party Ladies! A few weeks ago I wrote a piece titled White Women As Oppressors following the Kavanaugh hearings. Many on the Left were outraged that so many white women, looking at their own husbands, brothers and sons and realizing this could happen to them, chose to support the confirmation of Brett Kavanaugh to the Supreme Court. That was bad enough. Then the midterm elections happened and boy howdy, things went from bad to worse! Those dastardly white women didn't vote 100% for Democrats! The audacity! The white supremacy! Here are a sampling of tweets right after the election. Mmmm, I love the smell of ideological totalitarianism in the morning! Liberal women vote for liberals because they are strong, independent, empowered women. Conservative women vote for conservatives to avoid being beaten. It is also worth pointing out that when black women vote 95% for a cucked little pansy, "Beto" O'Rourke, that is empowering but when white women give Ted Cruz a slight edge over "Beto" in their votes, it is a sign of Stockholm Syndrome. The message is that white women are not permitted any sort of agency. Instead of men "controlling" them, progressive activist will control them. Their votes are pre-ordained to belong to a small cult of feminists and far left activists that alone get to decide what is best for "all women". The language of "accountability" and the lumping of modern "feminist" ideals into a single set of policies that are deemed to be the only policies that are acceptable for women to support is pretty ominous. 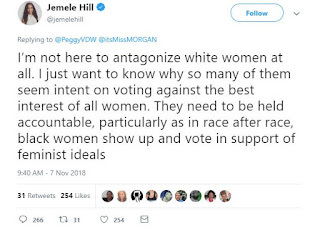 The deeper message is that white women can't be trusted to make their own decisions because they are complicit in "white supremacy". After all, white women give birth to and raise white boys and by and large they marry white men. To the Left, an untamed white woman is simply a walking white supremacy incubator. If a white woman won't do the decent thing and either abort her children or submit to sterilization, the least they can be expected to do is vote for Democrats. I can truly understand the frustration of the Left. 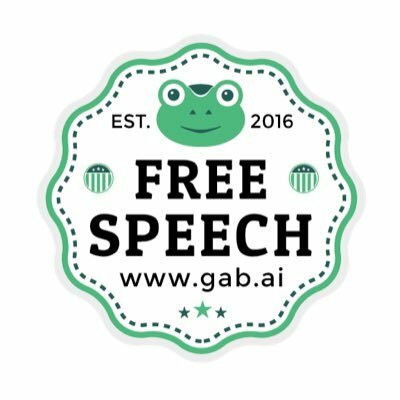 They completely own almost every institution that can be used for propaganda: the education system, the media, the entertainment world, big business and the government bureaucracy, and there are still people that refuse to vote as their betters tell them to. The only significant institution they don't own outright is the church and they are doing their best to destroy the church from within (Episcopalians/Methodist/ELCA Lutherans) or to subvert the church (the SJW movement in the Southern Baptist Convention, homosexual priests in the Catholic Church). The stubborn insistence of the American people to form and hold their own opinions is the bane of the progressive experiment. While white men pretty consistently vote Republican, white women remain perhaps the one true swing vote in our electorate. Blacks vote overwhelmingly for Democrats, and have for decades and are unlikely to change anytime soon. Hispanics vote around 2 to 1 for Democrats, and also are unlikely to change. Asians and Jews, somewhat inexplicably, are about the same as Hispanics as far as voting goes. Where both parties can change an election is white women. The Kavanaugh fiasco was as much about trying to frighten/anger white women into voting for Democrats as it was keeping Kavanaugh off the Supreme Court but it seems to have backfired a bit. We won't know for sure until 2020 but either way this sort of rhetoric simply inflames the identity politics arms race. Until the Democrat plan to pack America with non-white voters comes to fruition as younger Hispanics and other non-whites reach adulthood, elections will be determined by which is more successful: Republican efforts to get white voters to show up and vote or Democrat efforts to convince them not to. That means that white women are going to be the hottest electoral commodity around for a little while longer until progressives don't need them anymore and then they will be tossed aside like Christine Blaisy Ford after the Kavanugh hearings. What is clear in the aftermath of the 2016 and 2018 elections is that the progressive strategy for getting the vote of white women has shifted away from persuasion to bullying. White women don't deserve a scolding because they voted their own consciences in the last few elections. They deserve gratitude from those who benefit from the struggles and triumphs these women have faced for centuries and for the hard fought victories they won. The ancestors of today's American white women were the women who fought for the right to vote. They toiled alongside their husbands while raising their children as Europeans settled North America, spread west, conquering a continent of over 3.5 million square miles. These women faced disease and starvation, and attacks from often hostile Indians, while carving out a new nation from a vast wilderness. When war called their men away in the Revolution, the War of 1812, the Civil War and both World Wars, these women stayed home and held the country together. 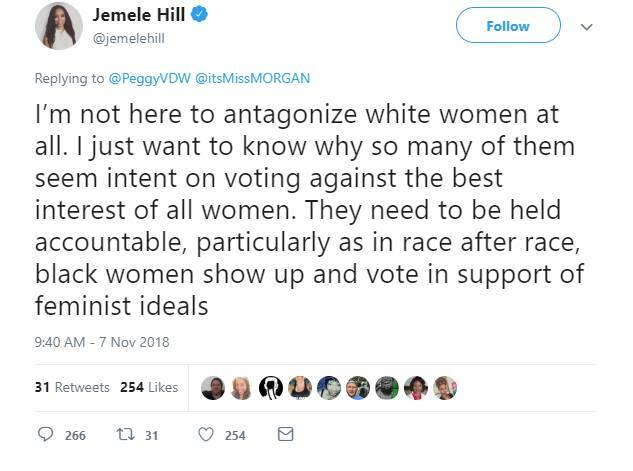 White women don't need the approval of anyone else and they don't need to be told who they may or may not vote for. While I am sure many white women will feel cowed and be bullied into voting for Democrats to preserve the "right" to kill their unborn children, dutifully voting for the same policies and politics that have devastated their families, I am hoping many more will reject being slandered and insulted, and even threatened, and vote for the party and candidates that they believe are best for them and their families. I trust white women to form their own opinions. It is ironic that the party that unilaterally has deemed itself to be the sole arbiter for what is good for them doesn't trust them to think for themselves.